Signature :Kazusa Kami Fujiwara Kaneshige. Gold inlay Hutatsu Do Saidan. Shinto Jyosaku :Ryo Wazamono cutting tesat ranking:Musashi. Aoi Art Syosin paper : NBTHK Tokubetsu Hozon Token. Blade length : 54.5 cm or 21.45 inches. Width at the hamachi : 3.01cm or 1.18 inches. Kasane :0.65 cm or 0.25 inches. Era : Edo period, around Kanbun era. and also forged sword in Sesshu province, present Mie pref. His sword is very sharp and ranked at Ryo-wazamono. on highly-spirited temperline resembled to Kotetsu. with gold color and open work. Fuchikashira: Shakudo Nanako, dragon is engraved wih gold color. From Aoi Art: Kaneshige's blades cut well, Ryo-Wazamono. 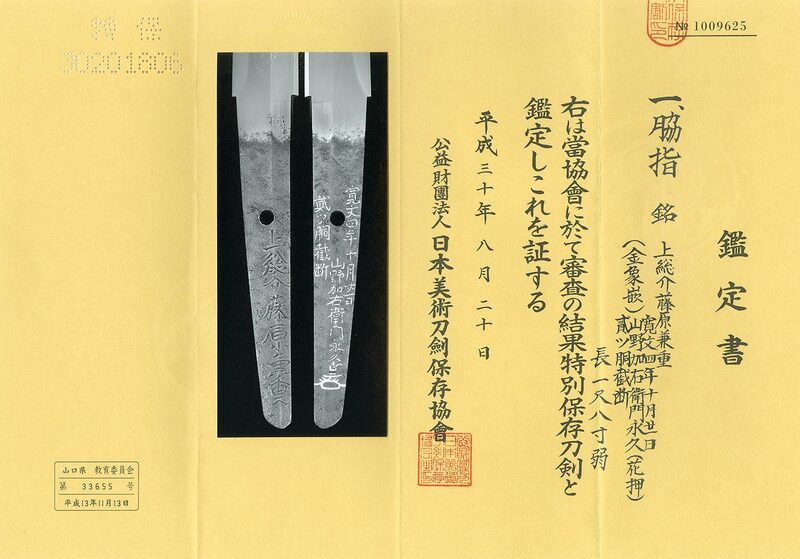 A large number of his blades were designated as a NBTHK Juyo sword. There are many Kamano Kauemon's cutting test Kaneshige swords. It is said that the great swordsman Miyamoto Musashi's favorite sword was Kaneshige. Hadori style is similar Kotetsu. Yamato Kami Yasusada, Hojoji Masahiro, and so on.